Pelican Hardigg AL (All Latch) Shipping Cases are designed with the most protection for the rough shipping environments they will travel through. Reinforced corners and edges allow for additional impact protection and positive anti-shear locks prevent lid seperation after impact. 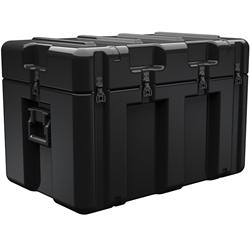 The exterior of the case has molded in ribs and corrugations for secure non-slip stacking along with recessed hardware for extra shipping protection. These cases come standard without any foam, but foam options are available if you call and speak with an Atlas Case representative. Interior Dimensions29.75" x 17.87" x 20.12"
Exterior Dimensions32.75" x 20.87" x 21.93"
Shipping Dimensions35" x 23" x 24"
Inside 2" Foam Lined Dimensions25.75" x 13.87" x 16.12"